Made for those I-don’t-have-time-to-do-my-make up mornings, meet the greatest make up multi-tasker... 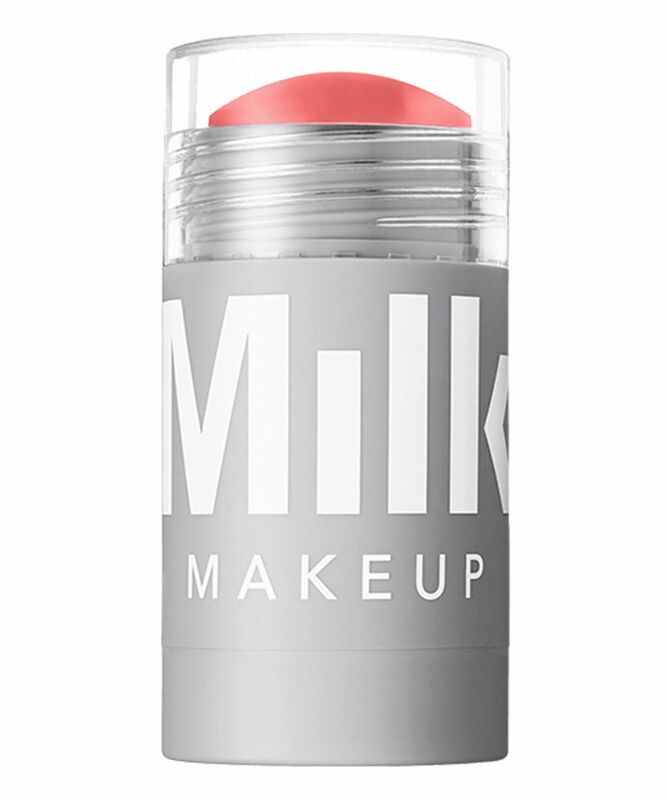 Milk Makeup’s Lip + Cheek means there's no need to waste time finding blusher and lipstick. This twist-up stick can be swept across cheeks for a soft, dewy flush then applied to your lips for a cool pop of colour. 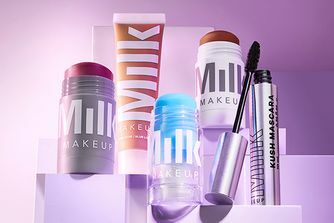 Plus, it wouldn’t be Milk Makeup if it didn’t have a slew of good-for-you ingredients; this boasts a cocktail of oils and plant butters to nurture and shield from free radicals. Part lip tint, part blush, Milk Makeup’s multi-purpose Lip + Cheek is perfect for those who want glow on-the-go. 100% vegan and cruelty-free, this creamy colour glides on seamlessly, diffusing easily to lend a just-pinched flush or cute, just-bitten tint. With five shades to choose from - from berry-hued 'Quickie' to pale 'Dusty Rose' via neon pink 'Swish' - each colour builds effortlessly so you can transition from low-key to look-at-me drama whenever you crave some intensity. Infused with conditioning, vitamin-rich avocado oil, mango butter and peach nectar (but not a single paraben), the formula hydrates and lends a healthy dewy sheen. We'll take five, to go. Swipe across cheeks and/or lips for a burst of colour. Got a sample with my purchase in the shade Werk. It's great consistency, blends effortlessly to an even finish, looks really, really natural. Not my choice of shade for the lips but it's ultra comfortable, not drying whatsoever. Unfortunately it's still unavailable for purchase in my country, so I'll cherish my little sample until hopefully I can buy Milk Makeup one day. I'm impressed. Milk should do more shades in these, muted rosy brown or peach would be to die for in this formula. What an amazing product! I have tried countless creamy cheek products over the years and they have either set too quickly/be too runny/not blended nicely or been a real faff to put on compared to a powder. I have always longed for that easy, dewy flush and finally, here it is with Milk cheek and lip tint. Werk is obviously the star of the show here. Such an easy to wear colour on cheeks, plus lips. I have the full size for at home and the mini for on the go. I need to get more minis! Really is universally flattering and an amazing finish. BUY IT! So easy and comfortable to use! I saw the Milk products recently in a video with the founder of Milk and Sarah Jossel of the Sunday Times and liked the look of them, so I bought the highlighter and absolutely loved it. It is so subtle and easy to apply. I loved it so much I came back and bought the blush. Loved that too (in Werk) soooooo came back again and bought the bronzer. It gives such a pretty, warm glow to the face which in the summer months I'll amp up to a full on tan. These products are just the best! This is heaven. Smells amazing, my skin is so happy and glowy, stunning on lips as well. It really transforms your face in a second; a more healthy look, more alive, more young and hydrates well. I've got it in Perk and it's fantastic...truly recommended! Gimme all the shades now!! I bought this In Perk and I’m in love with it... so easy to apply... beautiful, glossy, amazing on the skin. Love it! I received a deluxe sample of Werk, and got lots of use out of it. The texture is fantastic, blends beautifully and you can build up the pigmentation. I love this product for travel, or on the go. I got Werk as a sample with my order and I adore it. Beautiful color to get that healthy look, easy to apply. I use it mostly as a blusher. I'm a sucker for a trend item and saw so many bloggers with this in 'werk'. I wasn't thrilled with the colour when it first arrived, it's a bit more pearly than I'd expected. But I've actually grown to really like it. A one stop for lip, cheeks and I've been using as an eyeshadow. Would recommend. This arrived today and i'm already in love. It's such a wonderful colour and it's a two in one product, which is great for my unnecessary tiny handbag. Best blush and so much product for the money really worthwhile and fav buy so far this year! I bought this in Werk and I can’t believe how stunning it is. It’s almost identical to the now discontinued cream blush from Nars in Penny Lane. So so natural. I like a powder blush when I want to look more made up but this will be my every day go to. LOVE LOVE LOVE!! Easy to apply, blends like a dream. Good colour and gives you that glowy glossy flushed look which I like. Not sure how this would sit on an oiler skin as it is quite oily/balmy but I’m a normal skin so fine for me. Would buy another colour as just so easy to use! I bought this in the shade Swish, which looks a really bright pink in the tube. It blends really well into a lovely healthy looking pop of colour, which instantly lifts your complexion. I love it so much I've also ordered it in Perk and Werk. Shade is subtle on the skin but buildable. A slight purple sheen with the pink. Prefer use on the cheeks more than the lips. I love this product! Very easy to use and a beautiful colour on both lip & cheek. If it had more staying power I would have given a 5 but the fact it’s versatile and you can just throw it in your bag means I’d still highly recommend this product. This product is so dewy and glowing it will make you look healthy and radiant. It does fade a bit, since its a cream product but it reapplies beautifully and its easy to carry along with you if you need. I have werk and perk and am looking to take berry next! I have very fair skin and bought this in the shade werk and wow! So much product, such a lovely shade, and blends really nicely. I have been so excited for this product for ages!! I bought the full size werk and love love love the colour so much! not to mention the packaging and also the formula is so lovely! Thank you! can't wait to spend more money woo! What a stunning colour and such and incredible formula . It looks so natural on the cheeks and is very nourishing on the lips, giving a lovely natural tint. I really recommend this product, especially if you are new to the brand! The shade Perk is a bit of a disappointment! It’s very, very sheer and I struggle to get it to build into anything without it picking up all the foundation underneath. I’ve tried with both my fingers and a stippling brush. That said, I may buy a different shade in the future because I really like the bronzing stick and I’ve hear such good things about other shades. I like the dewy make up look and when Cult beauty started selling Milk I really wanted to try this. It's so easy to use and looks nice on the skin. I brought Werk and I have a pale skin tone with pinky undertones and it looks really nice. Easy to apply, looks great. The best and easiest blusher I have ever used. Wonderful product, I got the colour werk, and I am so pleased with it. Applies like a dream, so easy, I now need everything in the MILK range! Werk is such a gorgeous universal colour, it blends beautifully, it's buildable and foolproof to use. No glitter, I don't find any shimmer at all, although it does leave a lovely glow. I tried the product for a few days before reviewing it and, ladies, it is nothing short of superb! Absolutely love it and will never use anything else. It’s so practical, easy to use and I feel beautiful wearing it. Thank you Milk!!! Excellent product. Easy to use. Can apply with sponge, brush or fingers. I apply after foundation and concealer. However, if I forget to apply, it goes over a powdered face really well also. The colour is v natural. Works equally well on lip and cheek. On lips, it is a very "your lips but better" colour. You get a lot of product for your money and the packaging is super compact and clean. Great for travelling. My first Milk purchase and I will surely be buying more. I bought this in the shade werk and I love it. I wasn't sure that the colour would be right but it is a beautiful pink colour. You only need a small amount, it goes on quite sheer and gives a lovely radiant look to the skin when used on cheeks. I found the colour a bit too light for the lips for me though. An amazing product. I have the shade in Werk and have been using it everyday since the day I bought it. It has amazing pigment, and looks so natural and dewy on the skin and best of all it lasts all day! Looking forward to adding more colours to my collection! It's a little pricey but don't think it'll be running out any time soon. I am living for this! It’s sheer so it can be easily built up. It’s glossy and glory and your skin feels and looks fab when it’s on! The colour is very pretty too! I love it! I've been looking for the perfect blusher for at least a year and spent a fortune in the process. Then Milk came to the UK a few weeks ago so thought I would give it a go. This blusher is absolutely the BEST... I can't fault anything about it, the stick application, the colour, the texture, the long wear. It's all brilliant. I really can't fault it. I've never been one to go all out on makeup, I always just stuck to foundation, eyeliner and mascara really. One reason being that my skin can be very dry and the more product I put on makes it more noticeable. I wanted a nice blush to make my face look less 'flat' and not all one colour. This was a valued purchase because this product does not dry to my skin and is blendable. I brought it in the color 'werk' and it works great as both a blush and lip colour. Now I'm using this in my daily life. This is a great product. Ease of application is perfect - the stick is very buttery and does not drag over the skin at all. This makes it more convenient than the glossier cloud paints. I have the shade werk and will certainly be picking up perk when I get the chance. I don't find the longevity to be great (better and cheaper) in this category are the CYO all cheeks and eyes) - however, that is a common trade-off with cream products and I still highly enjoy the product. Received the lip and cheek tint in werk as part of my sample selection. I am not a big user of cheek blush/tint so when I saw the product and the colour I was dubious. After two days of use I am in love with this product the colour is not as intense as I feared it would be and it offers a really natural and healthy radiant finish. Easy to blend and dries well without any greasy or wet residue I will now wait for more stock as this is a must have!! I purchased this in the shade perk and got a lovely free gift in the shade werk. Perk is absolutely beautiful on the skin. It gives a natural, radiant flushed look which is buildable. I was scared as it looks so bright but its very creamy and blends seamlessly. Also the smell is gorgeous. Werk is also beautiful and I love it on the lips as its like your lips but better. Highly recommend! The amount of product you get is insane but if I ever run out, I will be purchasing! I'm not kidding when I say this is my absolute favorite multi-use makeup stick. It was just the right amount of pigment that can be a nice sheer flush with a single swipe or can be built up. It's truly gorgeous and worth the money.